Don’t tell him this because I don’t want to embarrass the bloke, but getting to spend time with John Quinlan as part of this co-guiding work we do together is one of the reasons for the whole experience being so much fun. Obviously I hope that this comes across to our clients - and surely fishing is so much about the laughter - but I also love talking with John about all that he sees and experiences through a long guiding season. It continues to fascinate me how much John will concentrate on fishing surf conditions during the course of a year - and I have come back from this guiding trip with a bouncing brain that keeps on thinking about targeting what I would call “proper” surf conditions for bass…………. Which in turn means that a lot of you reading this by virtue of where you live and fish quite possibly either have never seen “proper” surf conditions or might never get the chance to try and fish them. I am talking about proper surf beaches, and I am not talking about targeting rougher conditions which plenty of us do anyway - nope, I am on about mainly west or south west facing beach and those bigger autumn and winter swells especially produce waves that the surfers so want to see. We all get rougher conditions on the marks we fish, but not all of us get those stunning sets of clean green waves rolling in that are very unlike a turbulent mess of chopped up water which you might get on a rock mark. 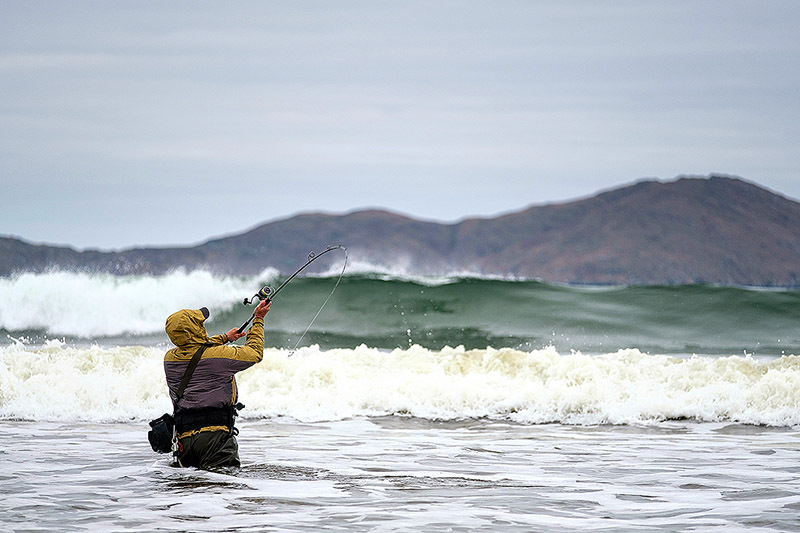 The main beach close to where John lives over in Kerry is a classic surf beach, and when those swells roll in it can concentrate the bait and the bass will often home in on it. A friend of John’s caught an 11.5lb bass on a metal lure in an 11m swell a few years ago, and whilst an 11m (eleven metre) well does not mean you get 11m high waves, take it from me that we’re talking about some serious bass fishing conditions the like of which I would suggest that most bass anglers aren’t remotely geared up to properly fish. We can put away our regular bass rods and lures for a start! If I lived in a part of the world like Kerry then I would have a surf fishing setup sitting on my rod rack for those times when conditions got big, and the rod would be capable of punching at least 50g+ lures into a potentially strong headwind, with reel to match. I’d be forgetting all about a lovely and smooth high end Japanese spinning reel as well, not with how much saltwater will end up inside it when surf fishing - the far more robust and what seems to be a far better sealed Penn Slammer III is really growing on me, and that’s the kind of reel I’d be going for if I didn’t want to spend far more on a Van Staal. I love my local Whitsand Bay for example, but when the conditions get big it tends to colour up and get very weedy, whereas the true storm beach over in Kerry that I know can take some serious swells and remain very fishable is you are prepared and able to really get in amongst it. And I wonder how many bass anglers are deliberately targeting conditions like these on some of our surf beaches in areas such as north Cornwall, north Devon, and parts of Wales? I also wonder how much surf fishing with lures there might be around parts of Ireland that just aren’t seeing many if any anglers. Every single time I head over to Kerry to work with John it amazes me just how few anglers we see, indeed I think we saw a couple of anglers when I was over recently - one was a fly angler targeting bass, and the other I think was a bait angler who looked liked he snagged his gear up on a shallow reef and then buggered off! Obviously there’s a long and rich bass fishing history centred around those classic surf beaches and standing amongst those white tables of water with a bait rod in hand - but are there many anglers out there really going at class surf conditions with the lure gear? Bass aren’t going to concentrate in any numbers if the bait isn’t there, but if it happens over in Ireland then surely it can happen over here in autumn and early winter especially? Blasting out bigger metals/casting jigs/slow jigs/Line-Thru Sandeels and Bass Bullet type lures etc. into the kind of water conditions that are trying to sweep you off your feet is somewhat different to quietly presenting soft plastics in an estuary, but surely that’s the whole point to lure fishing? It’s amazing how bass will hit lures in such turbulent conditions, but they do, and I would suggest that if you ever meet John Quinlan then you ask him about some of the best surf sessions he has been part of over the years. Holy cow it’s some exciting stuff. I accept completely that I may well be barking up the wrong tree here, but surely a big part of travelling around for fishing, guiding and photography is about seeing different kinds of fishing and then wondering if any tricks are being missed back home. We all default to what we know the best because we want the best possible chance of catching fish, but I often wonder if there is more fishing out there that we are missing for whatever reason - and I think about the surf beaches that aren’t very far from where I live and I keep wondering if there’s another side to bass lure fishing that I should be seriously going at…………..